In August of 2006 the shallow soil region located in Midland, Glasscock, and Upton Counties received 7 to 10 inches of rain. The vegetative conditions might not be the same for years. Plants are the best indicators of the habitat, and determine what wildlife (birds, reptiles, insects, and mammals) will be present. 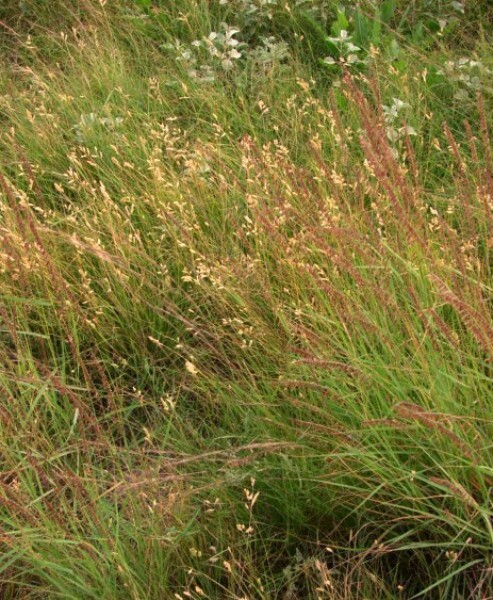 The Sibley Nature Center is sometimes asked by ranchers to identify grasses for them, and to instruct them on grass identification. 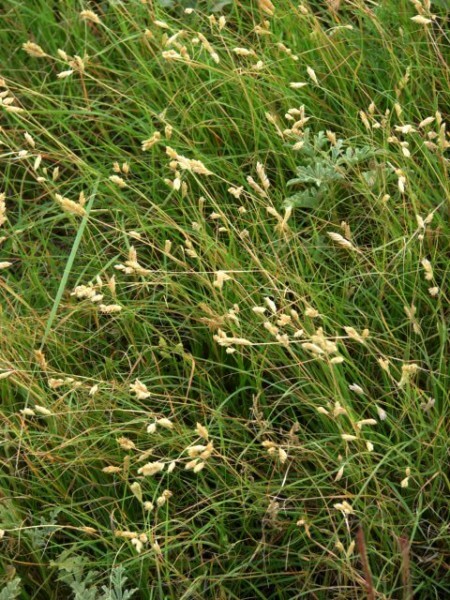 Tobosa and burro grass are often dominant grasses. 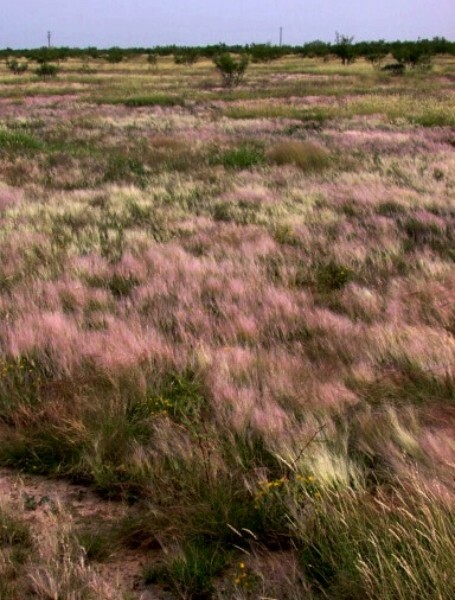 The burro grass is first pink and then turns white, with long awns (hairs on their seeds). In the background are the slightly yellow patches of tobosa. 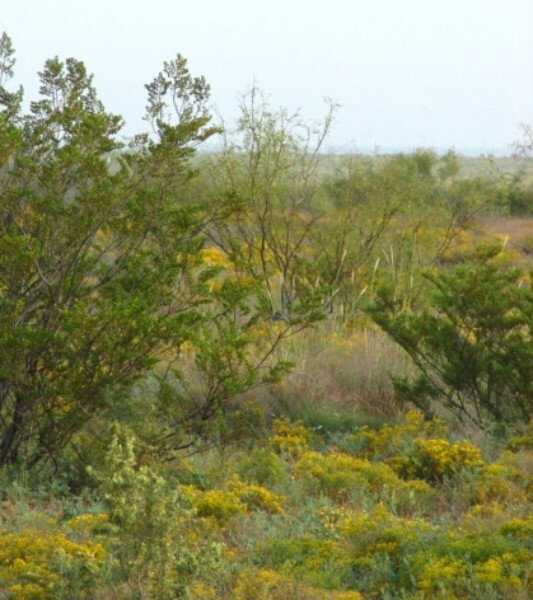 Mesquite (in the background) is often small in size because of shallow soil and quick runoff of rain. The grass in the foreground is tobosa with its spiky seedheads. In the background is burro grass. Neither species is especially good for grazing animals, and when these species are seen, the likelihood that sheep will be stocked on the ranches is greater. (To learn more about sheep ranching check out these two essays -- Sheepranching, and Tacinques (sheepshearers) in the "Living La Vida Llanero" section of essays. 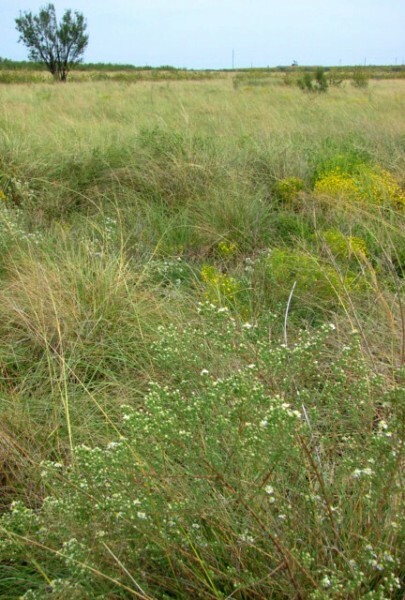 In areas with slightly deeper soils, including shallow playas and feeder draws, sideoats grama (the reddish spikes in the foreground) and buffalo grass (low grass with whitish spikes) becomes more common. 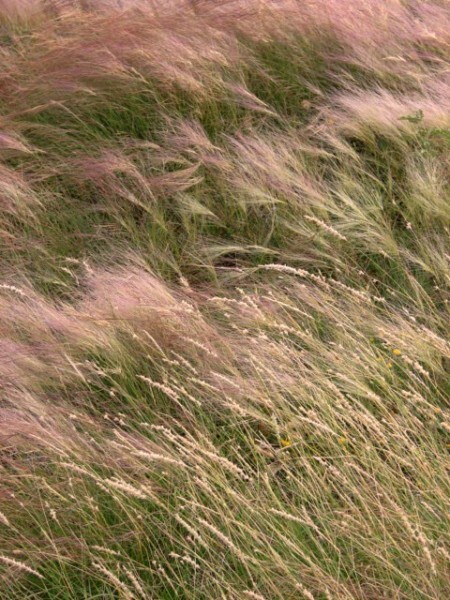 These grasses are more palatable to livestock, and if the land is overstocked, are the first to be eaten. 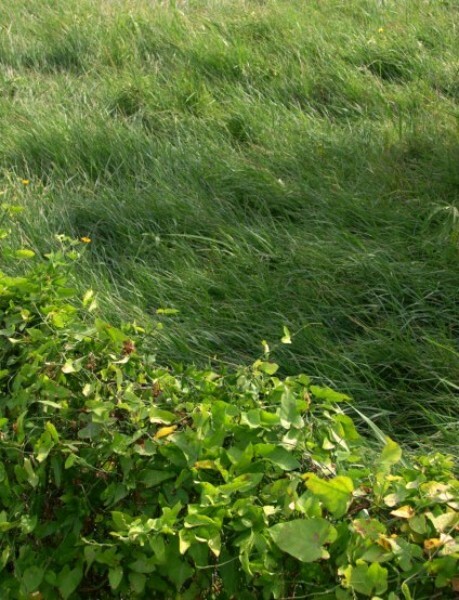 In some locations where rain water is collected cane bluestem can be found. This grass was the grass that was "belly deep to a horse" when the Llano Estacado was settled by ranchers during the 1880s (a rainy decade.) 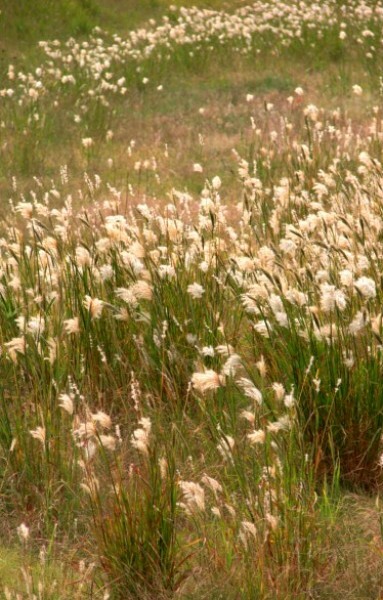 During the multi-year droughts that occur every 20 years, cane bluestem would die out. Much of the landscape of the region is covered by widely spaced shrubs. The large shrubs in the middle of the scene is allthorn. 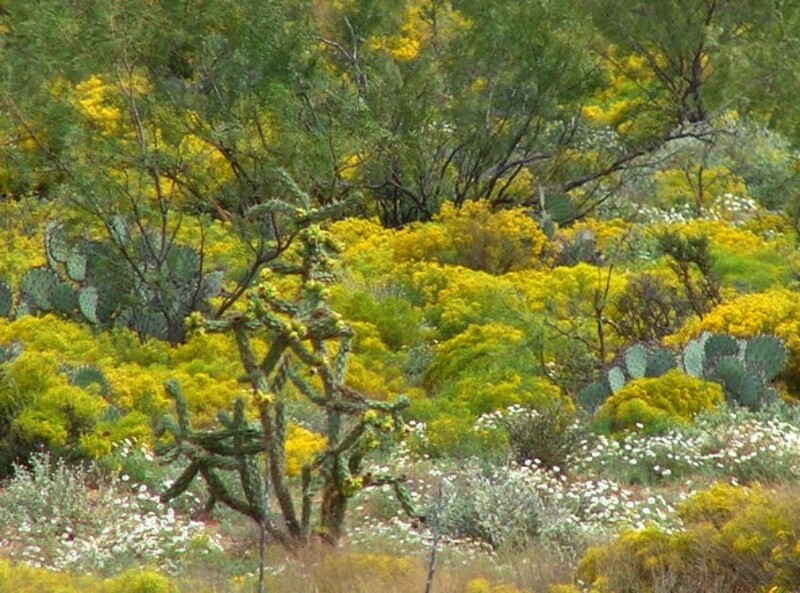 The smaller gray shrubs are lote (also known as blackbrush). On the left is a Torrey Yucca, which sometimes grows to 15 feet tall, and is another indicator plant of the habitat. 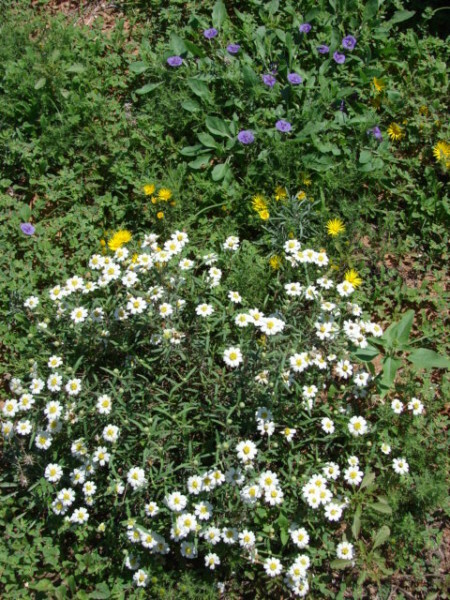 The white flowers are blackfoot daisy (sometimes called rock daisy), and the yellow is perennial broomweed. Much of the region is an oilfield. 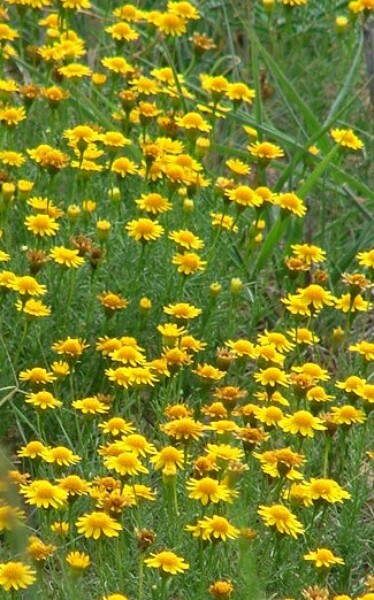 Blackfoot daisy in closeup, mixed with dogweed. Dogweed has a pungent odor, and when a person walks on it, or a vehicle drives over it, the strong scent is noticeable. Some people think it smells like dog urine, which provides it with its common name. The gray plant in the upper right hand corner is Tiquila, and is also often found in rockier soils. Dogweed in closeup. 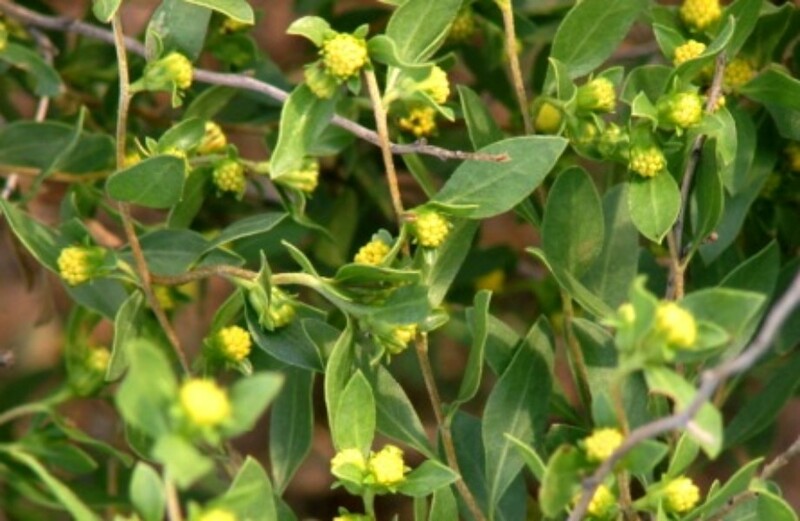 Despite the common name, it actually has a lemony taste and smell and should be considered a native culinary herb. 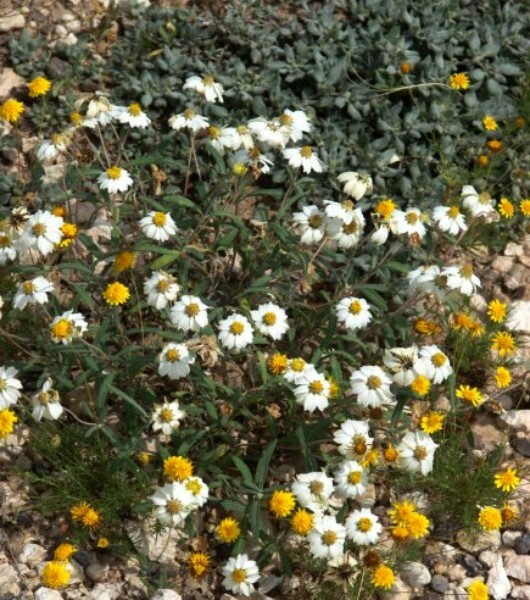 Another indicator plant of the habitat is purple ground cherry, here mixed with blackfoot daisy and the ubiquitous spiny yellow aster which grows in almost every habitat of the region. 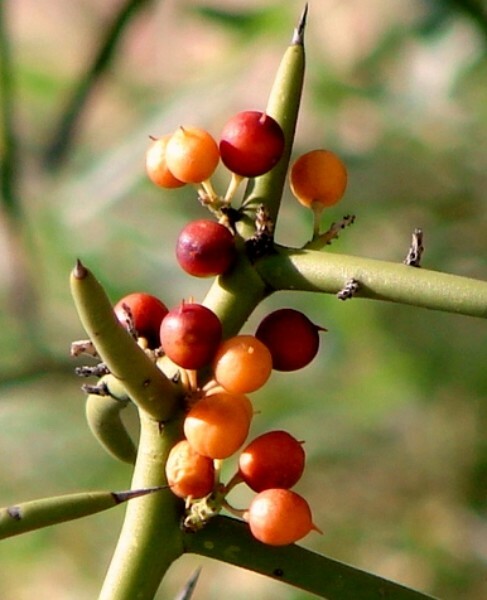 In late summer, after early summer rains, allthorn will produce showy berries that the birds love. The "champion allthorn" (the largest in the world) is found on a ranch southeast of Odessa. 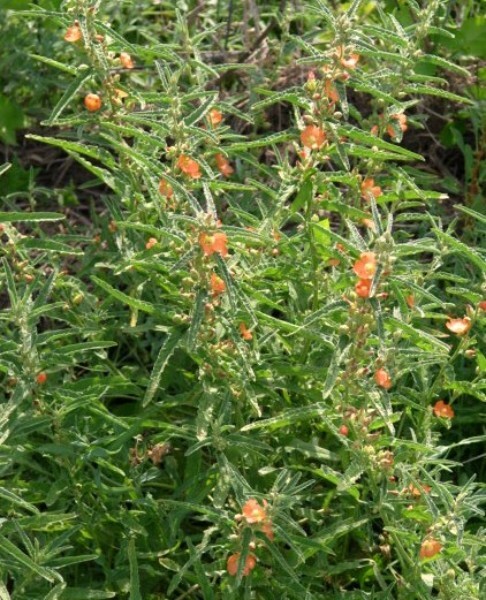 Tarbrush is another indicator plant of the habitat. It is usually a 2-3 foot tall ball. The leaves are not evergreen. In the foreground is broomweed. Tarbrush blooms are "daisy" blooms without the ray flowers (petals.) When stressed by drought, the leaves smell somewhat like asphalt. 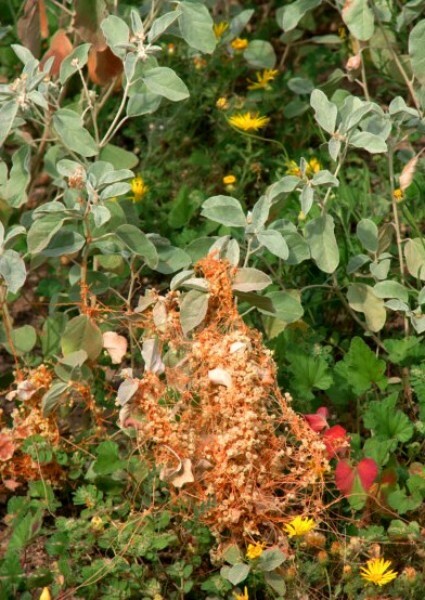 In winter, it drops its leaves, and in drought, the leaves will turn brown but remain on the plant. In the foreground is saltbush, which is more common in alkaline soils. 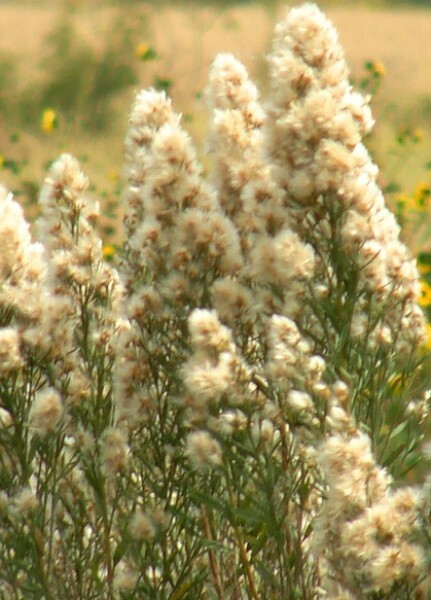 Saltbush will grow in several West Texas habitats. 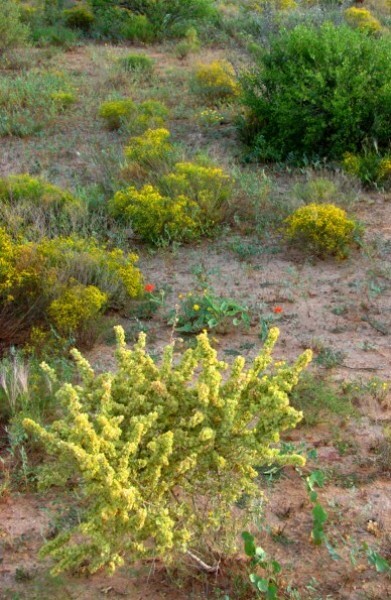 The round shrub in the background is tarbrush, and in between the yellow mounds of broomweed are seen. 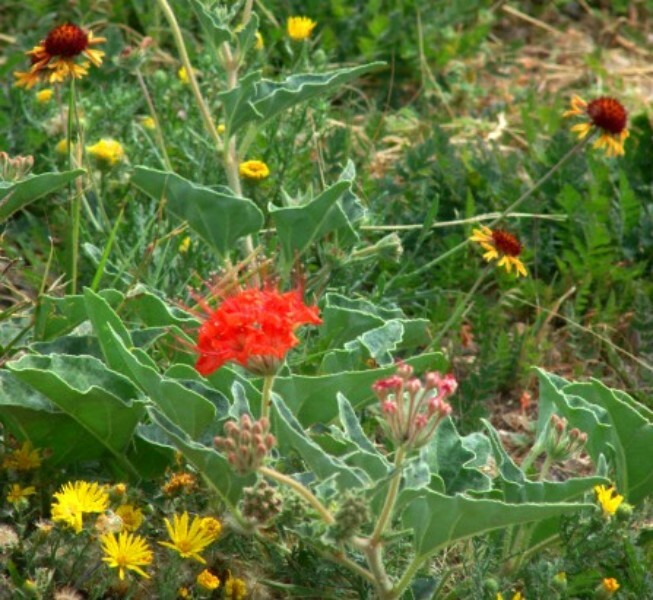 The red dots of color are the perennial wildflower Devil's bouquet, which is often found in several West Texas habitats. 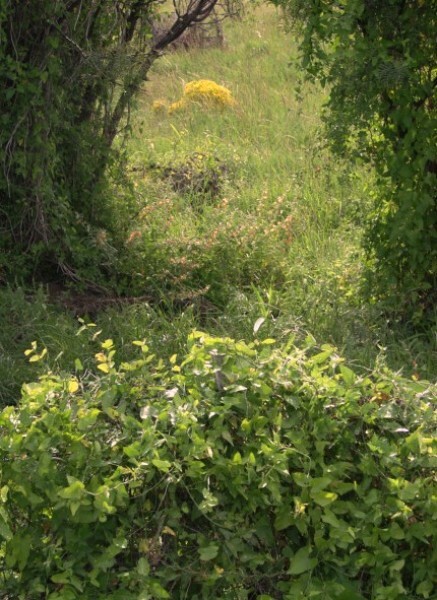 Tarbrush will sometimes cover the landscape in dense knee-high thickets. In the background are 6-8 foot tall mesquites. 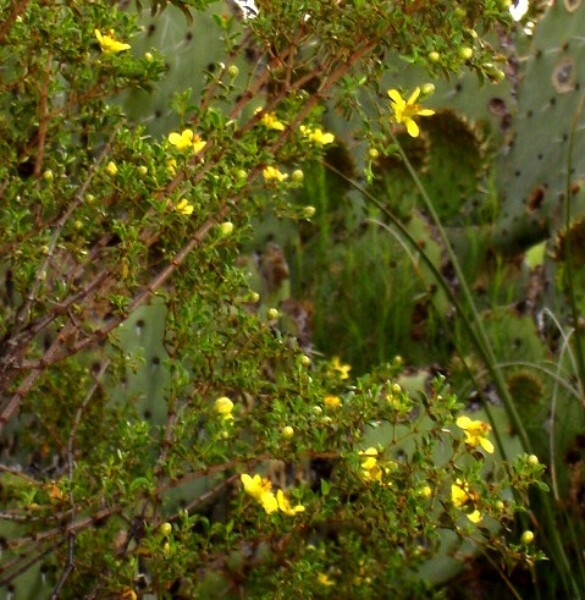 Another indicator plant of the habitat is creosote bush, also known as greasewood. Spherical, fuzzy white seeds follow the yellow blossoms. After a rain, the air is scented with its resinous smell - and many people of the American southwest will say "it is the smell of rain." When mashed into a paste and spread on a wound, it has medical properties that keep the wound clean and promote healing. Several species of insects only live on creosote bush and nothing else. In the background is prickly pear. 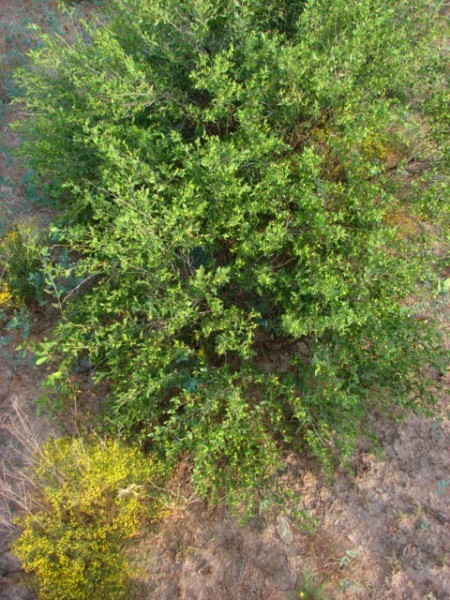 The larger evergreen shrubs are creosote bushes. 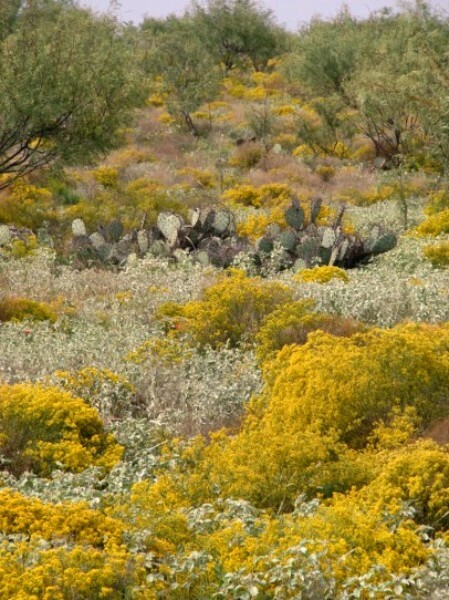 In the foreground is broomweed, and in the background is mesquite. 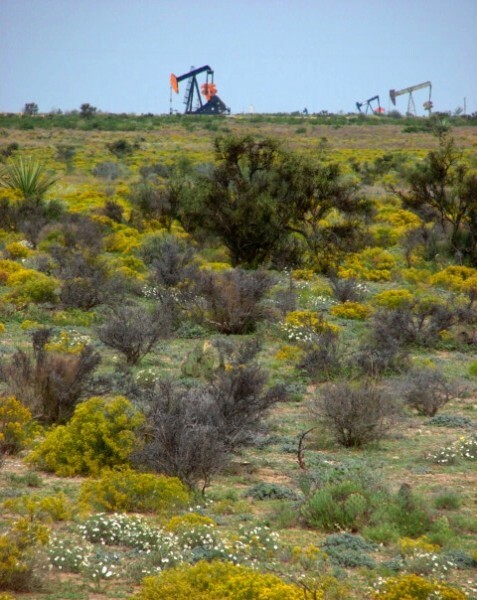 In the shallowest and driest of soils creosote bush will be the dominant plant and no other vegetation will be present. 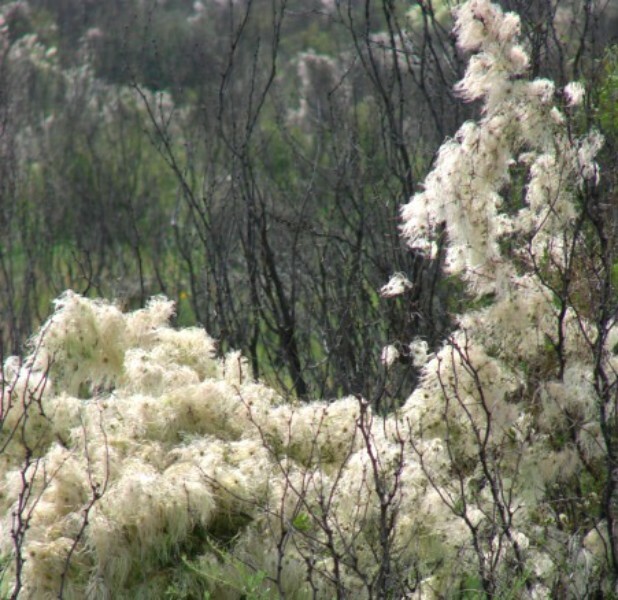 In a number of books, the authors report that creosote bush releases chemicals that prevent other vegetation from growing, but as can be seen, other vegetation can grow in the presence of creosote bush. 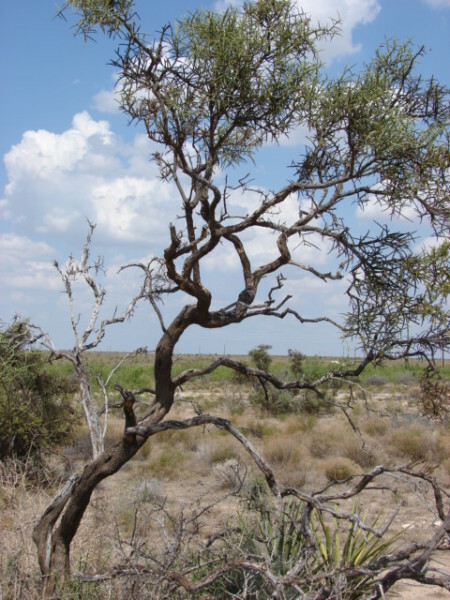 Like many of the brushy species of the region, creosote bush has expanded its range in West Texas in the last 50 years. 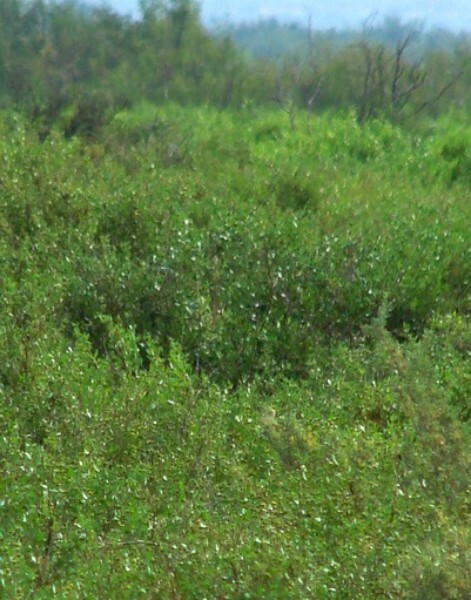 Places that were once tobosa grass flats are now creosote bush flats. Cane cholla, a shrublike cactus, (on the left) is another plant associated with the habitat. In the spring red blossoms are produced, followed by yellow fruit. Another common plant of the region is the gray doveweed, here interspersed among broomweed, prickly pear, and mesquite. The gray doveweed is a rhizomatous perennial forming clumps and carpets of gray as in the previous picture. The seeds of the plant are the favorite food of dove - and in most doves shot during hunting season their crops are full of the little football shaped seeds. 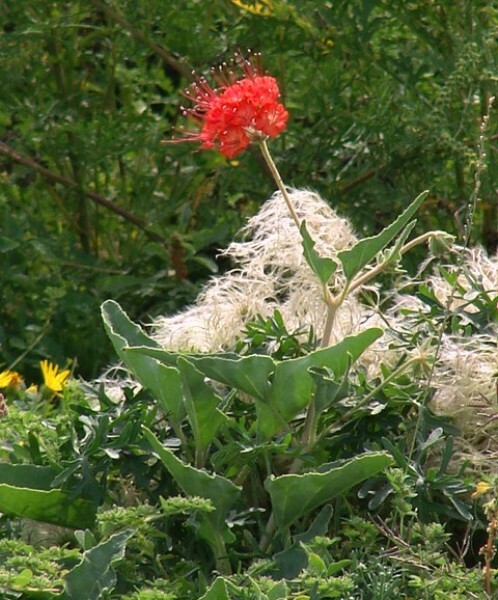 The orange string on the doveweed is dodder, a plant parasite, also known as love vine. In the days of the pioneers a girl would pull up some of the plant and throw it down on another plant, and if it started growing again, that meant her boyfriend would marry her. The green leaves are the winter rosettes of the annual wildflower Texas Geranium will bloom in March and April. 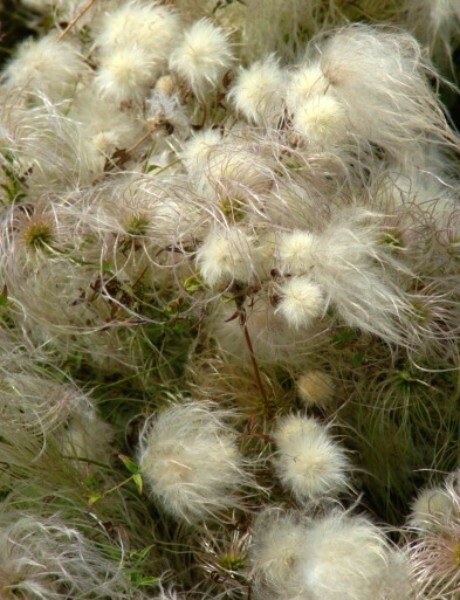 The seedfuzz of the native Clematis, known as Old Man's Beard, is a familiar sight in the fall and early winter. 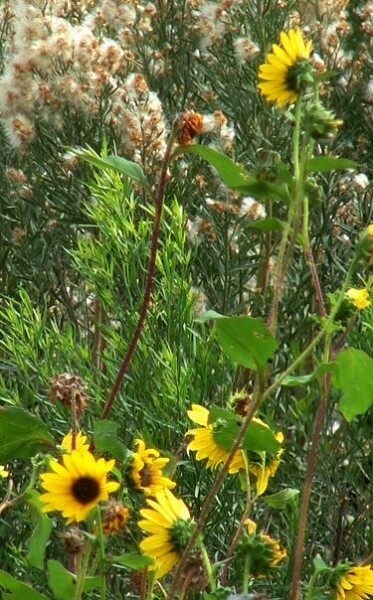 In the foreground is a meadow of vine mesquite grass mixed with yellow spiny aster. 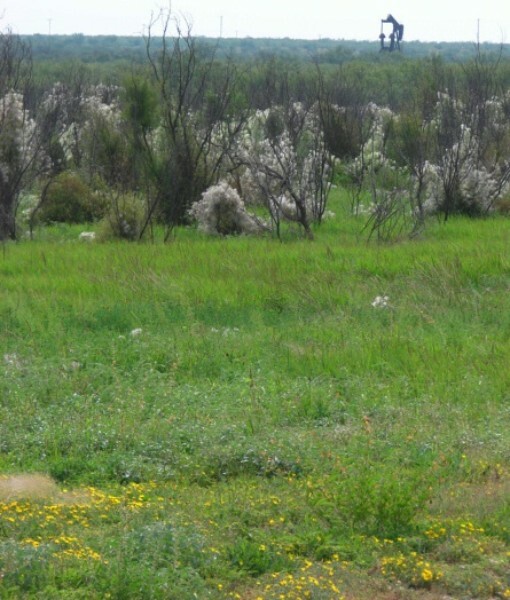 This pasture had been sprayed with Remedy to kill mesquite, but it did not affect the Clematis. In the closeup of Old Man's Beard, the dense white balls are the seedheads just opening, and the slightly pink ones are freshly grown to final size before turning white. Clematis will grow on the ground, and here it adorns a spectacular Devil's Bouquet. 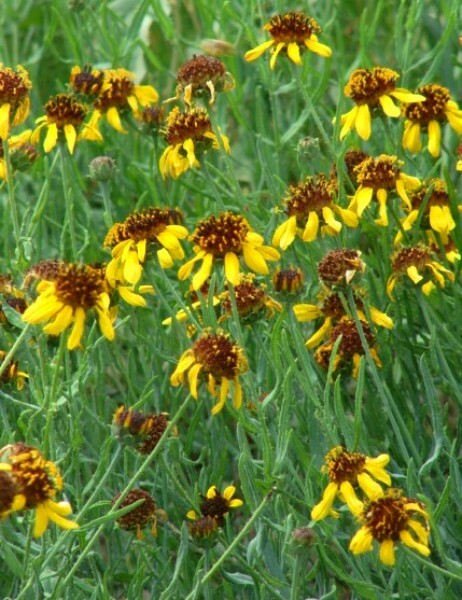 Next to another Devil's Bouquet is yellow spiny aster and yellow gaillardia, which is another plant most commonly found in the tight soils of the habitat. 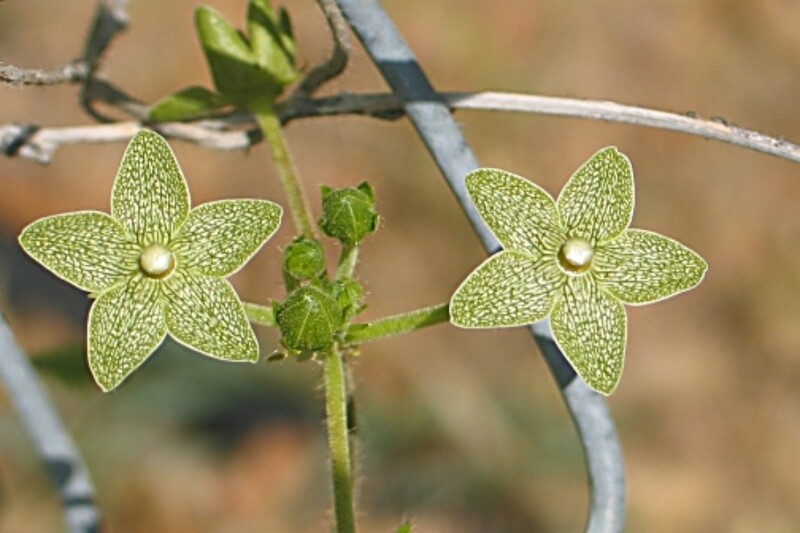 Matalea, a species of milkweed, is a rare vine on the Llano Estacado, and is much more common to the east, especially in the Rolling Plains region. In the background is vine mesquite grass. Matalea in close up presents a green star. Matalea will climb mesquite as well as fences. 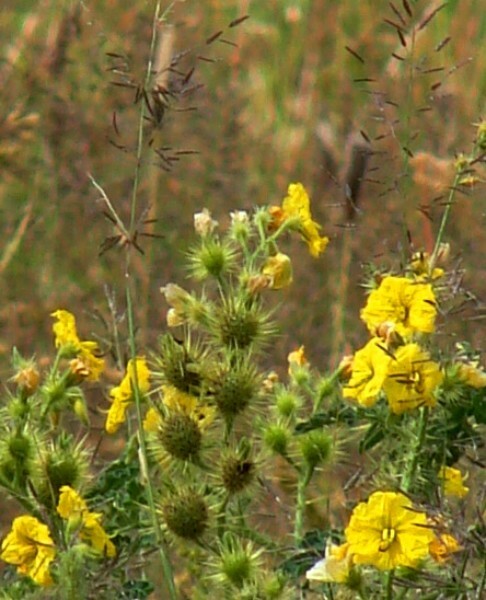 The yellow is perennial broomweed. Narrow leaved mallow also prefers tight clay soils in the habitat. It is in the previous picture, between the matalea adorned mesquites. In the foreground is the fall blooming perennial, Heath Aster. Beyond is the vast expanse of alkali sacaton, with one lone mesquite tree in the background. The brush covered hills (mesquite, creosote bush, tarbrush) are in the far distance. Like other members of the daisy family (or composite family) seepwillow produces thousands of seeds with hairs that provide lift when strong winds blow. Seepwillow was rare on the southern Llano Estacado until the rainy 1980s, when it began colonizing draws and playas. Its straight and light stems were a major source of arrow wood for the Indians, and were reputedly managed by trading groups such as the Jumanos to provide trade material. They would cut the plants to the ground each spring, and the straight new growth was cut in the fall and dried for the next year's trading expeditions. Blueweed (closely related to sunflower) and another perennial daisy, carpets the ground in places. 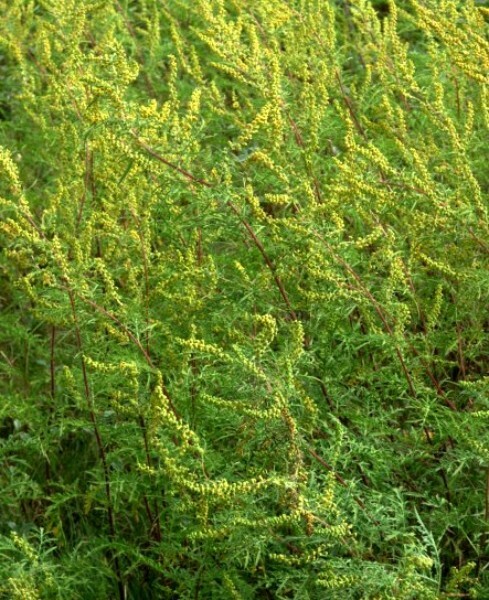 Ragweed also forms clumps in the tight clay soils. This is the major fall allergen on the Llano Estacado, with grass pollen the next most prolific allergen. In the disturbed soil channel, buffalo bur, a nightshade, can also be found.